When it bottomed at $7 per pound in 2001, uranium was one of the most derided commodities on earth. The most common associations with uranium were Chernobyl and bombs. Environmental protesters were calling for the shuttering of nuclear reactors, and plants continued to be mothballed. 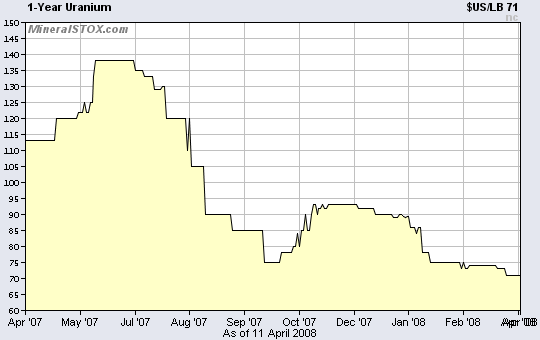 Then the uranium price crashed over the summer of 2007, bottoming at $75 per pound in September. It rallied over the winter to $93, before dropping again. Although the spot price seems to be stabilizing at $71, some uranium producers are still down over 70%, and some juniors like Alberta Star have lost four-fifths of their market caps in the past year. Many investors who were so bullish on the sector when the market made continual new highs are now distrusting the sustainability of the market at this lower level. The current sentiment is extremely negative, which is very exciting to a contrarian like myself. While some former uranium bulls are despairing, the correction was long overdue. In fact, I sent a warning to my Yahoo Group newsletter in early May that I expected a drop in stocks in the near future. I suspected that a new uranium contract on NYMEX would lead to more price volatility -- especially to the downside -- for uranium mining stocks. After the fierce decline in 2007 and the smaller selloff this year, I am certain that uranium is forming a bottom here. The potential increases in supply have already been priced into the market, while many risks to production are being discounted. The current lull in the market has allowed the spot price to drift lower. Uranium only needs a buyer to step in to turn the trend around. 1. The developing world will demand more energy. As formerly poor agricultural nations like China and India modernize, the rapidly expanding middle class will acquire the same conveniences Western nations take for granted. They will buy a car, a cell phone, a computer, and a couple of televisions to boot. All of these items will require more energy per capita. While these needs can be met by burning coal or natural gas, smart nations are planning ahead. China has announced its plans to build dozens of reactors and produce 150,000 megawatts of power from nuclear fission by 2050. 3 China used to have energy to spare, but in 1993 the country ended its status as a net exporter of crude. Now it's the third largest importer. China is expected to import 47% of its oil this year and is projected to match the U.S. in petroleum imported per day by 2030. Will all that oil be available when it's needed? Russia is currently building two reactors for India, with plans for four more at the same site. In addition, the U.S. agreed to sell India its nuclear power technology. India is vulnerable to energy disruptions as 50% of its natural gas is imported. Meanwhile, the need for predictable power generation grows voraciously. The Indian Prime Minister Manmohan Singh reported that their GDP was projected to grow over 9% this year, just below China's rate of 11.5%. Even Africa is joining the nuclear bandwagon. The continent is rich in uranium, with 18% of the world's known resources. 4 Many sub-Saharan countries have small or nonexistent petroleum resources and low electricity production. Since they don't have a large electricity grid, small localized reactors could solve many of their power issues. China, India, and Iran have offered to sell their nuclear technology to Africa in exchange for access to minerals. If this continent was able to develop their infrastructure in a large way, the impact on energy demand would be huge. 2. Peak oil is pushing the world to look for alternatives to petroleum. Most people are familiar with the peak oil theory developed by M. King Hubbert in 1956. Petroleum researchers such as Matthew Simmons and Kenneth Deffeyes have asserted that we will hit maximum production soon if we haven't already. This doesn't mean we are out of oil; we still have half the reserves left. However, our annual rate of production is expected to plateau and decline, and the steadily increasing world demand will be met (or not) by a dwindling supply of hydrocarbons . Unless the world makes major investments in producing power from alternative sources, the oil-dependent world will be buffeted by price spikes and shortages. Much of the petroleum reserves are located in unstable countries like Iraq and Nigeria, as well as countries unfriendly to the U.S. like Iran and Venezuela. This makes America and her allies vulnerable to political disruptions in supply like in the 1973 OPEC oil embargo . With the popularity of SUVs and long commutes with no passengers, any drop in supply would be hugely disruptive to the U.S. economy. Biodiesel and ethanol are currently used to substitute for gasoline. However, the October 2007 issue of National Geographic explains that ethanol delivers less power per gallon than gas, requires special pipes to transport it, and is made from crops that would normally go to food production. While biodiesel is more efficient, it still diverts food resources to energy. This has pushed up the price of food like corn and soybeans while requiring more use of natural gas-based fertilizers to grow all these crops. Until we use more efficient sources for biofuels like algae and switchgrass, we will exacerbate the drawdown in grain stocks while only making a dent in energy production. 3. Environmental pressures are making nuclear power more attractive. While nuclear power is not the cheapest, hydrocarbons have their own problems. To avoid the higher cost and tighter supply of oil and gas, many power plants burn coal. Coal is plentiful in the U.S. and South Africa among other countries, but it's very dirty. It produces sulfur dioxide and nitrous oxide, components of acid rain and smog respectively. In addition, the byproducts from burning coal are more radioactive than nuclear waste. 7 In China, the pollution from coal plants is believed to contribute to 400,000 premature deaths per year. India is building coal plants almost as fast as China to serve their population of over over one billion. Nuclear plants however, release very little carbon and are likely to be favored by countries who have signed onto the Kyoto Protocol. These carbon taxes could make nuclear power cheaper than coal, especially for developed nations. 4. Uranium is still a very cheap fuel. In 2001, a pound of uranium was about $7, less than a pizza. That's incredible when you realize that one ton of uranium is the energy equivalent of 16,000 tons of coal or 80,000 barrels of oil. This makes uranium about 60 times cheaper than oil at the current prices. The major cost in a nuclear plant is not the fuel itself but the permits and construction of the plant, which must meet stringent safety criteria and inspections. However, costs to electricity providers who go nuclear will be subsidized by the incentives to build reactors and the limited liability passed by Congress in 2005. 9 This legislation makes the effective cost per kilowatt very competitive with plants fueled by hydrocarbons. In addition, a recent Standard & Poor's report claims that newer units may cost only $2 per megawatt more than a pulverized coal plant. As uranium is a small percentage of the cost structure, the metal could increase in price substantially and still not change the affordability of the electricity. Spot uranium is now at $71, which is much lower than the inflation-adjusted high of $143.51 reached back in 1978. 10 I am using the U.S. government numbers which I believe are artificially low, so the real discount should be much higher. As the last time we had a uranium bull market we didn't have peak oil or the industrialization of Asia, the fundamentals point to a much higher price. 5. Supply is not easy to increase. Although uranium is a fairly common element in the earth's crust, the process of obtaining refined yellowcake is not easy. Since uranium ore is radioactive, mostly from the associated radon and radium, miners need special ventilation and shorter hours underground than other hard rock miners. Care must be taken that the soil and water isn't contaminated. The mines must be inspected regularly to ensure safety and security of the ore. Proposed uranium mines face a lot of public opposition. Recently, Aurora Energy Resources was impacted by a three year ban on uranium mining on Labrador Inuit lands. In addition to the environmental objections, governments are loath to issue permits due to the fear of terrorists stealing ore. Even if companies are able to produce uranium, nations with working mines may apply many conditions to the sale of the metal. Enrichment could stretch energy supplies by recycling spent fuel to refresh the percentage of usable material, but most countries forbid it due to fears of nuclear proliferation. Mines take several years to start up even if you have proven a sizable resource. For example, Paladin Energy acquired the Langer Heinrich property with drilling complete and a favorable pre-feasibility report and it still took five years to start mining. Cameco's Cigar Lake started public hearings in 1996 and due to flooding problems, production is not expected to start until 2011! Due to years of low prices, there was little investment in uranium mining infrastructure. Mines were closed and plants were shuttered. The nuclear plants that weren't closed used up the local stockpiles or excess Russian fuel from decommissioned nuclear warheads. Professionals left the industry in droves and retrained for other careers. Today, there is a shortage of qualified engineers, as 28% of the nuclear work force will reach retirement age in the next few years. 11 The U.S. relies on Russia for 50% of its uranium from surplus weapons, but Russia has indicated it may not renew those agreements when the expire. Nearly 35% of current nuclear plant fuel requirements come from government stockpiles and surplus weapons uranium, and those sources are nearly depleted. 12 For these reasons, the Asia Pacific Foundation of Canada predicts a shortage of 45,000 tonnes of the metal over the next decade. So how can you make money from the uranium bull market? Unlike many analysts, I don't recommend buying exploration stocks. It can take over ten years to build a mine after you find a sizable deposit. I doubt the price will be peaking that far in the future. These companies are unlikely to make a profit even if they are successful explorers. Also, uranium is 40 times more common than silver in the earth's crust. It isn't that rare an element so it's better to focus on historic areas that have abandoned mining rather than surveying promising terrain. Most of these exploration companies have what I call “interesting dirt” and will never own more than a patch of slightly radioactive land. The simplest play on uranium is to buy the metal. No, you can't put it in your safe but you can do the next best thing. Buy shares of Uranium Participation Corporation (U.TO), a corporation that stores uranium at power plants. It has corrected due to a slump in the spot price, tax loss selling and recession fears, but I feel it will bottom soon if it hasn't already. Buying a share in stored uranium means you just have to worry about the commodity fundamentals. You don't have to worry about country or company risk, permitting issues, the risk of the discovery not being as good as hoped, or the difficulties of fuel enrichment. When you buy stored metal, the uranium exists and all those risks are already dealt with. Everyone loves to talk about explorer stocks because they can make huge gains -- but remember that most of them go out of business, so their high potential return comes with very high risk. I prefer to look for value in neglected assets. I suggest that if you buy the case for uranium, the real value is in the metal, not the explorer stocks!